Space - NightClub in Miami. Space Miami - this is one of the most famous clubs in the U.S.
Space is the most popular festivals of music and noisy parties.The founder of the «Space Miami» is Louis Puig.Despite the fact that Louis already had other clubs, he decided to build something that will be more than just a disco.«Space Miami» differed from other clubs by unusual design,sizes, and non-stop operation.Due to modern lighting, sound and catchy appearance of «Space Miami» became an example not only for the clubs of Miami, and for the whole country. The club played successful DJs such as Paul Van Dyk, Paul Oakenfold, John Digweed, Sasha and little known at the time Tiesto.All of them are extremely positive about the club, which adds to it more and more popularity.In 2003 «Space Miami» moved to another building. The design of the club has changed under the influence of new trends.Now it was a huge building with a rooftop terrace, capacity of the club was also significantly increased. 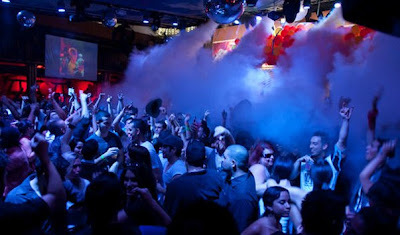 Already in the walls of the new «Space Miami» crowds of fans gathered well-known DJs such as Danny Tenaglia, Erick Morillo, David Guetta, Eric Prydz, Steve Lawler, Deep Dish, Paul Van Dyk, John Digweed, Sasha and Tiesto.The club has already received general recognition and love of the public. «Space Miami» conquered many peaks and is not going to stop there. I'm really into house music, and this place really makes me happy every time I go! I just went to see that one of the crazy games in the bones of my favorite DJ acts and wow what a night! The only thing that got me really pissed off, was that one of the VIP-staff would not let me in VIP with all my friends due to my shoes .. I wore Michael Kors high top sneakers that were probably worth more than his whole outfit. This pissed me off a bit, but other than that the club - usually really cold with lots of like-minded people who are there for one purpose and one purpose only for the love of music. Wow, what an amazing night!! Jackie Ritchie - amazing patron and always there whenever I have any questions before I get into the city. I live a couple of hours and sometimes its nice to have someone as knowledgeable as Jackie to answer any of my questions. Adress: 4 NE 11th St, Miami, FL 33132. Drink up your stress by spending a gala time in the night clubs in Miami. Spend an amazing and enjoyable time amidst your close companions with ease. Being moderately priced, these are a huge hit.